The public remains divided over whether Islam is more likely than other religions to encourage violence among its believers. Currently, 40% say the Islamic religion is more likely than others to encourage violence while 42% say it is not. These opinions have changed little in recent years. 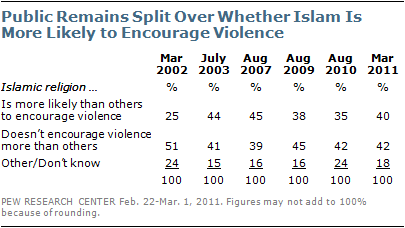 But in March 2002, just 25% saw Islam as more likely to encourage violence while twice as many (51%) disagreed. The national survey by the Pew Research Center for the People & the Press, conducted Feb. 22-March 1 among 1,504 adults, finds that most young people reject the idea that Islam is more likely than other religions to promote violence. Nearly six-in-ten (58%) of those younger than 30 say Islam does not encourage violence more than other religions; 31% say it does. By contrast, a plurality o f those 50 and older (45%) say Islam is more likely to encourage violence. Political and ideological divisions are even wider: By roughly three-to-one (66% to 21%), conservative Republicans say Islam encourages violence more than other religions. Moderate and liberal Republicans are divided – 46% say Islam is more likely to encourage violence, 47% say it is not. By more than two-to-one (61% to 29%), liberal Democrats say that Islam is not more likely than other religions to promote violence. Conservative and moderate Democrats, by a smaller margin (48% to 31%), agree. Fully 67% of those who agree with the Tea Party movement say Islam is more associated with violence than other religions. Among those who disagree with the Tea Party, the balance of opinion is nearly reversed – 62% say Islam is no more likely than other religions to promote violence while 24% say it is. Among the large share of the public that offers no opinion of the Tea Party, 38% say Islam is more likely to promote violence while about the same number (41%) disagrees. A clear majority of white evangelical Protestants (60%) say that Islam is more likely to encourage violence than are other religions. Far fewer white mainline Protestants (42%) and white Catholics (39%) express this view. And by nearly two-to-one (56% to 30%), the religiously unaffiliated say that the Islamic religion does not encourage violence more than others.